Calling for ‘a more open dialogue regionally and internationally,’ Sharjah’s Bodour Al Qasimi accepts and commits to UNESCO’s designation of the emirate as World Book Capital 2019. The Sheikha Bodour Al Qasimi talks with UNESCO director-general Irina Bokova in Paris. Looking on is the United Arab Emirates minister of education, Hussain Al Hammadi. Formalizing UNESCO’s selection of the United Arab Emirates’ Sharjah as World Book Capital for the year 2019, a memorandum of understanding (MOU) has been signed in Paris by UNESCO Direct0r-General Irina Bokova and the Sheikha Bodour bint Sultan Al Qasimi. On hand to witness the signing were the UAE’s permanent representative to UNESCO, Abdullah Ali Misbah Al-Nuaimi, and the UAE’s minister of education, Hussain bin Ibrahim Al Hammadi. Cities nominated as UNESCO World Book Capitals must undertake to promote books and reading and to organize substantive programs and activities for the year of their tenure with the honor. The signing ceremony at Bokova’s offices in France effectively signals Sharjah’s acceptance of the responsibilities of a World Book Capital and affirms the emirate’s commitment to the program. Sharjah will follow Athens as World Book Capital, and planning for 2019 in the UAE—while still under wraps—is said to include an Olympics-style ceremony at Sharjah’s Al Majaz Amphitheater on Khalid Lagoon in the city center. “For centuries, Sharjah has played a key role in the cultural and artistic exchanges that took place between the major centers of civilization. We have long held the view that the interaction of people and the free exchange of ideas improves relations between cultures. “I’m very pleased that I could sign an agreement this morning with Bodour Al Qasimi, for the nomination of Sharjah as the World Book Capital in 2019. We at UNESCO are giving this title to different cities in the world that are known for reading and publishing. “Sharjah deserves this nomination because we have a long-standing partnership. For more than 20 years, we’ve had the UNESCO-Sharjah Prize for Arab Culture, and it’s not the first time that His Highness the Sheikh Dr. Sultan Al Qasimi, member of the [UAE’s] supreme council and ruler of Sharjah, has supported UNESCO in its cultural activities: for more than 30 years, under the auspices of UNESCO, Sharjah has organized the famous Sharjah International Book Fair. “For us, it’s about giving more visibility to what Sharjah is doing to support these activities. For us, it’s also about the Arab world, the privilege of sharing this beautiful Arabic language. The founding CEO of Sharjah’s Kalimat publishing house (10 years old in April), Bodour is also a member of the International Publishers Association’s executive committee and its Freedom to Publish committee, which just announced its 2017 Prix Voltaire winners. A conference on freedom of expression is reportedly in the works as part of the 2019 program. Making Sharjah the first Arabian city to become a World Book Capital, the events of 2019 and 2020 around the designation are to be kicked off April 23, 2019, coinciding with World Book and Copyright Day—echoing Bodour’s establishment in March of the Arab world’s first “reproductive rights organization,” or RRO. The presence of that organization, created in association with the International Federation of Reproduction Rights Organizations led in Brussels by Caroline Morgan, reflects the Emirates Publishers Association‘s commitment to copyright law. As last covered shortly after Book Expo this year, Sharjah has also positioned itself as a singular player in world publishing with its development of the world’s first free trade zone, Sharjah Publishing City, under the direction of Sharjah Book Authority chair Ahmed Al Ameri, A host of international publishing-related concerns are leasing space in the unique facility now. 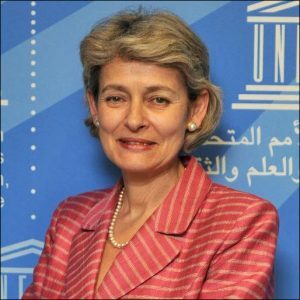 As reported by Publishing Perspectives, the announcement on June 26 by Bokova at UNESCO of Sharjah’s selection has been applauded by the international publishing community as an apt recognition of the decades of effort by Bodour Al Qasimi and her father, Sharjah’s ruler, Sheikh Sultan bin Mohammed Al Qasimi, an accomplished historical author. The royal family has personally devised and overseen a panoply of initiatives in literacy and the elevation of Arabic literature, by way of making Sharjah the cultural hub of the Arab world. Among the most widely admired of these efforts is Sharjah’s “Home Library Project,” which by mid-January of this year reportedly had placed some 2.1 million books in more than 42,000 Emirati households. In eight years, the program has produced and delivered 42,366 home libraries, each equipped with 50 books provided by the emirate’s Knowledge Without Borders agency. The goal is a ground-level development of a family-wide “daily reading habit,” easily one of the most prized concepts mentioned by international publishing players interviewed by Publishing Perspectives. The World Book Capital advisory committee comprises representatives of the International Publisher’s Association, the International Federation of Library Associations, and UNESCO. It’s this committee that designated Sharjah as the 2019 nominee.